You accidently lost your photos and albums on computer when your computer crashed or when you delete them unexpectedly. You purchased a new computer and there is no any pictures on your new pc, therefore you want to transfer some photos from iPod to computer for further use. You have taken many photos and stored in Camera roll, so you want to backup them to PC or share with your families and friends. With too many pictures taking a lot of storage space on your iPod touch, you decide to export them out to make room for other files. iTunes is regarded as the first choice for most Apple users when we want to transfer files to computer. However, when we want to transfer photos from iPod to computer with iTunes, we will get stuck. iTunes is a one-way transfer tool, and it only allows us to transfer files from computer to iPod touch, but never transfer files back. If we sync the iPod touch with iTunes, the software will erase the files on the iPod touch and we won’t be able to find the files back. Launch Leawo iTransfer after installing it on your computer. When the software indicates that it is safe to connect the device, plug the iPod touch to computer via the USB cable. The software will recognize the device and detect the files of the iPod touch automatically. Then the iPod touch Libraries will be shown on the left sidebar. Click “Photos” on the left sidebar and all the photos of your iPod touch will be shown on the right part of the software. Click the transfer button (a right arrow in a dark-blue rectangle) at the right bottom to copy all the photos from iPod touch to computer. Or you can hold Ctrl key and click the photos to choose, and then right click the chosen photos to “Transfer to > My Computer”. After choosing photos, a dialog of transfer settings comes out. You are allowed to choose the target folder to save the photos. 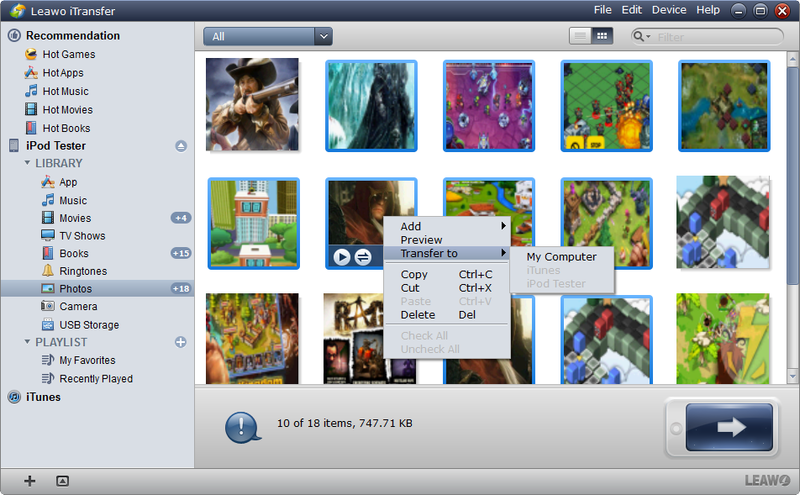 Check “Transfer to List: iTunes” and then you are able to transfer the photos to iTunes. 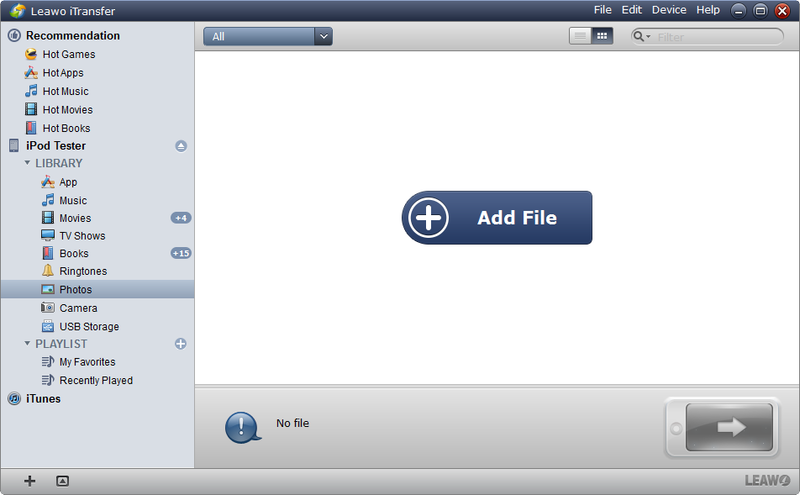 Check “Save to Folder” and click “Change” and choose the target folder to put all the photos. Click “Transfer Now” to start to transfer photos from iPod touch to computer. 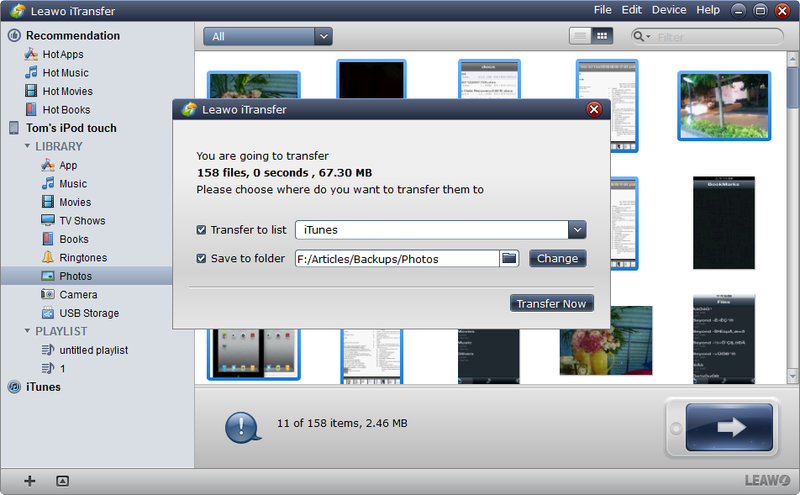 When the photo transfer begins, a dialog of transfer process pops up, and a progress bar shows the percentage of the transfer process. Normally speaking, the photo transfer will be finished in seconds, and when the photo transfer finishes, the photos will be in the target folder. While transferring photos from iPod touch to computer, please don’t disconnect the iPod touch, otherwise the photo transfer will stop. With the above steps, you may have known how to transfer photos from iPod touch to computer with ease. Of course, you are able to delete the useless photos of the iPod touch in batch with Leawo iTransfer. You can click “Ctrl +a” to select all the photos, and then right click the chosen files and choose “Delete”. Then you can delete the useless photos and free the storage space of the iPod touch.